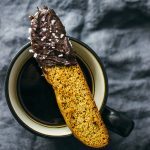 This is an easy recipe for gingerbread biscotti that doesn’t use any butter. Prepare 2 greased baking sheets. Combine and mix brown sugar, canola oil, and eggs in a bowl until well-mixed. Combine and mix the flour, baking powder, and gingerbread spices in a separate bowl until well-mixed. Combine and mix the contents of the two bowls. Form a dough. Divide the dough into two pieces. Place a piece on each baking sheet, and flatten them out into rectangles, about 4 inches wide and 1/2 inch thick. Bake at 375 F until golden brown, about 15-20 minutes. Without cooling, slice them into 1/2 inch slices and flip them on their sides. Return them to the oven to bake until lightly toasted, about 5 minutes. Then repeat for the other side of each biscotti. When done, let them cool while you prepare the chocolate coating. Optional: Melt the butter and sugar together in a bowl in the microwave. Stir in the cocoa powder until smooth. Spread onto one end of each biscotti and then sprinkle with sea salt to taste.